"I am paying attention to all the details so I hope I have a chance of bettering the record," he said. Campenaerts is a time trial specialist on the road, having won the last two European titles and finished third at the 2018 World Championships in Innsbruck. "This record, the individual world time trial title and the Olympic gold are the three dreams that I want to pursue in the next few years," added the Lotto-Soudal rider. "I do not think of being a better athlete than Wiggins. "The record of the hour is a unique challenge in cycling and breaking it would be a way for me to write a little bit of the history." There have been nine failed attempts to better the mark set by Wiggins, with no rider coming within half a kilometre of his record. 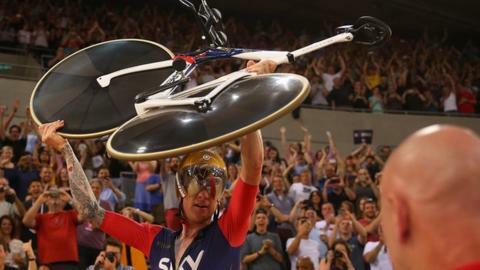 Wiggins won Olympic time trial gold at London 2012, days after becoming the first British rider to win the Tour de France. In 2014, he won the world time trial title on the road. On the track, he won four Olympic titles and seven World Championship gold medals. The Bicentenario velodrome saw Frenchman Francois Pervis break the 200m and 1km world records in 2013, while a German trio set a new team sprint world best. American Ashton Lambie broke the 4km pursuit record last August and in September, previously unknown Italian Vittoria Bussi rode 48.007km in 60 minutes to set a new women's hour record. Dane Martin Toft Madsen attempted to better Wiggins record at the venue but could only manage 53.630km.